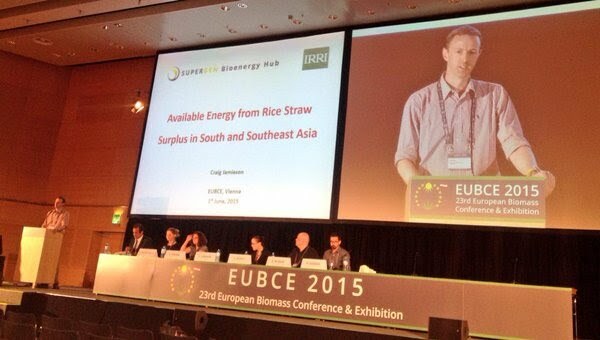 Findings of the Rice Straw for Energy Project were presented by the project's Coordinator, Craig Jamieson, at the European Biomass Conference and Exhibition 2015. The EUBCE is the event in which the members of the bioenergy community can get a broad picture of the situation and trends emerging in today's market. The Conference provides a high-level scientific programme and parallel events which attract participants from a wide-ranging background: researchers, engineers, technologists, standards organisations, financial institutions, policy makers and decision makers. This event is supported by European and international organizations. The Technical Programme is coordinated by DG Joint Research Centre of the European Commission.